Datsun India, the fully owned subsidiary of the Nissan Motors has recently rolled out its first ever compact MPV model Go Plus in the country's lucrative sub 4-meter segment. It is introduced in a total of four trim levels with petrol engine as standard under the hood. Among all the variants, Datsun Go Plus D is the base trim, which is fitted with a 1.2-litre petrol motor, which is also performing for the remaining variants in its series. Transmission duties are handled by the five speed manual gearbox that allows its front wheels to draw torque output. Although it is an entry level variant, it houses an array of convenience features including drive computer, follow-me home headlamps and second row tumble down seats. At the same time, it is also blessed with an engine immobilizer system that safeguards the vehicle from theft. It has a decent external appearance featuring black bumpers, door handles and a stylish radiator grille with silver frame. The most important aspect of this vehicle is its seating arrangement, as it can accommodate five occupants along with two children comfortably. Both the first and second rows have better leg and shoulder room, which makes it even comfortable while traveling. The manufacturer is offering it with an impressive warranty of 2-years without any constraint to its mileage. This newly introduced compact MPV has looks quite decent from its exteriors owing to its expressive lines and trademark features. Both the bumpers along with door handles are in black color scheme and yet, it looks quite attractive. Its front facade is fitted with a majestic D-Cut radiator grille with silver frame and perforated mesh, which makes it look quite stylish. It is surrounded by a distinctively designed headlight cluster that are powered by halogen headlamps along with turn indicators. The overall look of this vehicle is emphasized by the stylish company's insignia, which is placed in the center of grille. Its side profile has a few expressive lines on its door panels, which gives it a bit of modern stance. However, it gets steel rims as standard feature, which can be fitted with full wheel covers. Coming to its rear section, it has a wide windscreen, which is accompanied by a high mount third brake light. The back door is also wide and it is embodied with a license plate console. The taillight cluster has a clear lens design and it is equipped with a courtesy lamp along with powerful brake light and turn indicator. Coming to the interiors, this Datsun Go Plus D trim has a pleasant internal cabin that is done up with an attractive dual tone color scheme. Its cockpit houses an extremely large dashboard, which is skilfully embodied with a gearbox console. Furthermore, there are a few storage spaces provided for both the front passengers, which adds to the convenience. The dashboard also has a large instrument cluster, but there is only one analogue speedometer and an on-board trip computer. They displays information like digital tachometer, distance to empty indicator, low fuel warning light, electronic fuel gauge and various other such aspects. Its cockpit is furnished with connected seats, which eventually creates seating space for an extra passenger. While the second and third rows are furnished with ergonomically designed bench seats, which have split folding facility. On the other hand, there are a few utility features provided inside like door armrest, integrated head restraints, front door bottle holders and accessory power sockets. The manufacturer has equipped this vehicle with an advanced 1.2-litre petrol engine that has electronically regulated fuel injection technology. It comprises of three in-line cylinders featuring 12-valves, which displaces 1198cc. It is based on a double overhead camshaft valve configuration, which helps to enhance its power output. This mill can produce a maximum power of 67bhp at 5000rpm and yields a hammering torque output of 104Nm at 4000rpm. This motor is mated with a five speed manual transmission gearbox that releases the torque output to its front wheels. The manufacturer claims that the vehicle has the ability to give away a peak mileage of 20.6 Kmpl, which is rather impressive for a petrol version. This compact MPV is blessed with a superior braking mechanism featuring ventilated disc brakes for front wheels and drum brakes for rear wheels. They delivers superior stopping power and makes it quite simple to handle. Its front axle is fitted with a McPherson strut suspension system featuring double pivot lower arm. While the rear axle is paired to H-type torsion beam including high performance linear dampers. 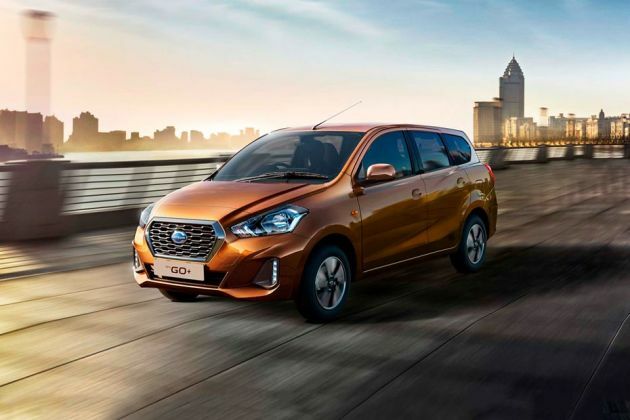 As far as its steering is concerned, this Datsun Go Plus D trim gets a manually operated steering system that supports a minimum turning radius of just 4.8 meters. This entry level variant is blessed with quite a few essential comfort features that helps to provide a comfortable traveling experience. It has a list of features including speed sensitive intermittent wipers with drop wipe function, second row assist grips, connected front seats, silver garnished AC vents, front seats with spinal support and plain fabric seating upholstery. Furthermore, it also has interior room lamp, storage trays for front passengers, ergonomically located parking brake, accessory power sockets, heater with blower, remote operation for opening of tailgate, second row tumble down seat and reclining front seats. The manufacturer has also incorporated an advanced drive computer that displays digital tachometer, average fuel consumption, trip meter and electronic fuel gauge. This vehicle has a lightweight body structure that is made using high strength steel material. It is further integrated with side impact protection beams and crumple zones at crucial areas, which can deal with jolts and can reduce the risk of injury to the occupants inside. The manufacturer has blessed this base trim with a few safety features like three point ELR seatbelts, child safety lock and an engine immobilizer. In addition to these, it has powerful halogen headlamps, high mount third brake lights and tubeless radial tyres, which enhances its safety levels. 1. Attractive exterior and interiors are its advantage. 2. Cost of running is quite affordable. 1. Rear cabin seating space is not comfortable. 2. Safety features are rather poor than other contenders.